Jeremy Corbyn has today outlined an alternative set of Brexit proposals. These would involve tweaking the political declaration to indicate the UK’s intention to negotiate a deal with a “permanent and comprehensive UK-wide customs union” including a say in future trade deals, and “close alignment with the Single Market”. This paper sets out five questions about the proposals. But the most pressing questions of all are now whether Labour will table this proposal as an amendment to be voted on by the House of Commons next week, and whether – should it fail to command a majority – Labour will then move to the next stage of its conference policy and campaign for a People’s Vote. “I’m pleased that Jeremy Corbyn has written to the Prime Minister setting out details of his own proposals for Brexit. “These have been hinted at before and it’s absolutely right to set them in a little more detail. It is also right that we ask whether they are deliverable, will meet the expectations of people who voted to leave the EU, and ask whether they will make Britain poorer or reinforce the austerity economics we all want to end. “If these proposals are acceptable to the Government and the European Union as a credible and viable route to Brexit then this should be quickly determined and Parliament should have the chance to vote on them. “But any Brexit deal that politicians are able to stitch together will not be as good as the deal we currently have with the EU. 1. How could Labour voters have any confidence it would actually be delivered? Today’s proposal calls for “significant changes to the Political Declaration” that would “ensure that any backstop would be far less likely to be involved”. This is a concession that the legally binding withdrawal agreement – including the backstop – cannot now be renegotiated. But it is also a recognition that any changes will not be binding. If Jeremy Corbyn secured agreement on his Brexit plan, it would be merely aspirational: Even if a majority of MPs voted for Jeremy Corbyn’s Brexit plan, there is no guarantee it would be negotiated. A new political declaration would be the diplomatic version of an IOU, neither binding nor anything more than a statement of intent. With a Conservative government likely to be responsible for the negotiations, there is no guarantee this intent would be delivered upon. The proposal would have as much likelihood of the UK falling into the backstop as the Government’s plan: Today’s proposal recognises that the backstop would remain, despite Jeremy Corbyn’s strong opposition to it. Yet the proposal would entail a long and complex negotiation, including a number of demands that the EU is highly unlikely to accept (see below), so the chance of it being negotiated by 1 July 2020 (the deadline agreed by the UK and EU for a decision over implementation of the backstop) is extremely low. 2. Would it make the UK poorer? Every form of Brexit will damage the UK economy: Forecasts and analysis by the Treasury and a number of think tanks have found that every form of Brexit will leave the UK poorer. A report by the National Institute for Economic and Social Research found the impact of staying in the customs union but not the EEA (as Labour proposes) would be a hit to GDP per capita of 2 per cent. There is no mention of services. Yet services make up around 80% of the UK economy, and around 80% of UK workers are in the service sector. Services accounted for 40% of the UK’s exports to the EU in 2017. 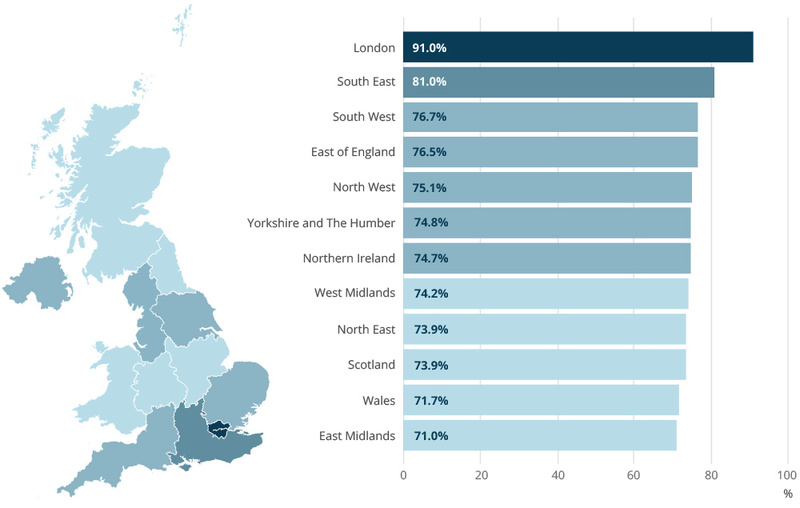 And across different areas of the UK, the services sector is largest as a percentage of the London economy (91%), but represents at least 70% of the economy in all other areas of the UK. For example, it represents 75.1% of the economy in the North West, 74.2% in the West Midlands and 73.9% in Scotland. 3. Does “close alignment with the Single Market” mean following EU rules without having a say over them? What these ‘shared institutions’ would actually be is unclear. The EU’s legal order is founded on the supremacy of the rulings of the Court of Justice. By leaving the EU, the UK loses any say on the composition of the court and there is no prospect of the EU agreeing that its own court would be subject to rulings of another body. Nor is it conceivable that the EU would create some form of ‘super council of ministers’ – effectively giving the UK a veto on the decisions taken by the 27 member states. No EEA country has such a veto. It is unclear how workers’ rights and environmental standards could be guaranteed outside the jurisdiction of the ECJ: As the Social Market Foundation have said: “The European Communities Act guarantees that a worker’s ‘floor of rights’ can be enforced locally across the European Union in national courts. This platform of enforcing rights is not guaranteed in any trade agreement.” So if the UK ended up in a free trade agreement with the EU, outside of the jurisdiction of the ECJ, there would be little to block a future government lowering standards in these areas. Any effort to avoid following rules made by the EU would have severe economic consequences: If Labour is committed to ending free movement and avoiding becoming an “across-the-board rule-taker”, the UK will by default not have the “same benefits” as it currently does as an EU member. 4. Would the UK still follow EU state aid rules? The EU’s negotiating guidelines prohibit undercutting on state aid: “The aim should be to prevent unfair competitive advantage that the UK could enjoy through undercutting of levels of protection with respect to, inter alia, competition and state aid, tax, social, environment and regulatory measures and practices.” If a UK government - Labour or Conservative – sought a deal that would give the UK an unfair advantage, it would be given short shrift by the EU. 5. Would the UK have any say over its trade policy? Jeremy Corbyn has today called for “a permanent and comprehensive UK-wide customs union… that includes a UK say on future EU trade deals”. But EU treaties grant the EU sole competence over its common commercial policy. If the UK stays in the customs union the default position is that the EU would continue to sign trade deals with third countries and, after each new deal, the UK would be forced to liberalise its markets for the new partner. The UK not would have any say or voting rights in any negotiations and would not necessarily benefit from new deals. It is almost inconceivable that the EU would agree: Treaty of Lisbon, Article 207, says: “The common commercial policy shall be conducted in the context of the principles and objectives of the Union’s external action... The Commission shall conduct these negotiations in consultation with a special committee appointed by the Council to assist the Commission in this task and within the framework of such directives as the Council may issue to it.” Turkey, which is the customs union but not the EU, has no say over EU trade deals. Being in a customs union without a say would be very damaging: The EU would continue to sign trade deals with third countries, and after each new deal the UK would be forced to liberalise its markets for the new partner – despite a lack of participation or voting rights in any negotiations. Worse still, the trade deals would only apply to the EU. If the EU signed a deal with Australia, Australian goods would enjoy full access to the UK (with its shared EU tariff), but UK goods would enjoy no automatic reciprocal rights in Australia. Indeed, Australia – having already secured its advantage – would not be compelled to sign any reciprocal trade deal with the UK. If it did choose to do so, it would likely offer far inferior terms to the UK than to the EU. The UK would, after all, have little additional to offer, and consequently little leverage.